Sunday November 11th 1894 It was cold day. I was busy about the house all forenoon. One of my eyes was so inflamed with cold that I could not go away from home. In the evening Miss Swanger came out to sew for me this week. Monday November 12th 1894 It was a dark cloudy night. I was busy with my work the most of the day. Miss Swanger got my cloak nearly done. There was nothing I could do to help with it and my eye is so inflamed I could not sew much. Will went down town in the evening for things we need. Jake Ham came out to see Miss Swanger. 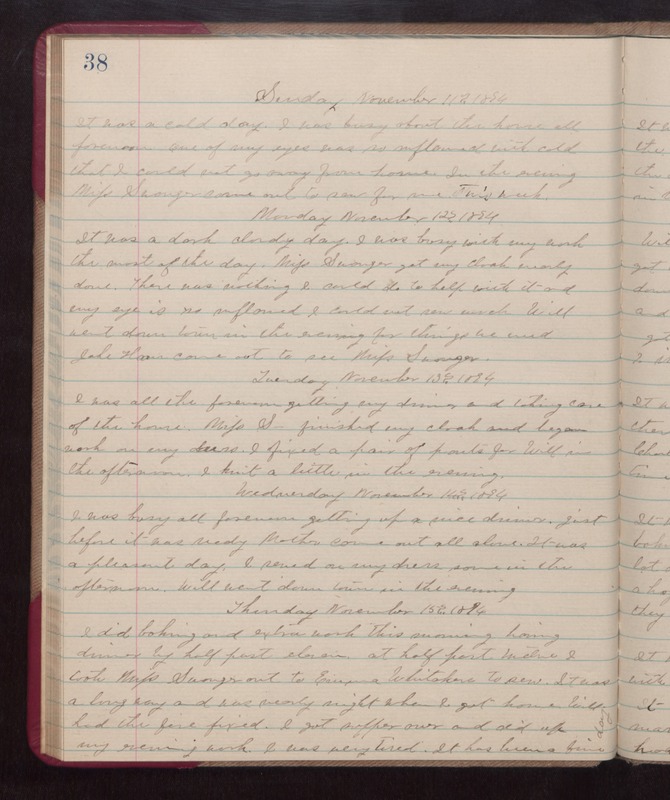 Tuesday November 13th 1894 I was all the forenoon getting my dinner and taking care of the house. Miss S-- finished my cloak and began work on my dress. I fixed a pair of pants for Will in the afternoon. I knit a little in the evening. Wednesday November 14th 1894 I was busy all forenoon getting up a nice dinner. jist before it was ready Mother come out all alone. It was a pleasant day. I sewed on my dress some in the afternoon. Will went down town in the evening. Thursday November 15th 1894 I did baking and extra work this morning having dinner by half past eleven at half past twelve I took Miss Swanger out to Eugenia Whitakers to sew. It was a long day and was nearly night when I got home. Will had the fire fixed. I got supper over and did up my evening work. I was very tired. It has been a fine day.